Reading, especially with kids, is a great way to get big messages across. With Earth Day on the Way (T minus 11 days), there are some really fabulous books out there to get kids thinking on ways they can be tending our planet. One of my favorites is "Michael Recycle" by Ellie Bethel. A superhero donning a colander as a helmet & his tell-tale green cape, Michael goes about cleaning up his town. There's also a sequel "Michael Recycle Meets Litterbug Doug." The lilting rhyme & pictures instantly draw in kids of any age. Then there's the classic which you'd be remiss if you skipped: Dr. Seuss' "The Lorax." Best line ever: "Unless someone like you cares a whole awful lot, nothing is going to get better. It's not." At the end of reading this, your youngsters and you might be "speaking for the trees," just like the Lorax. Jennifer Keats Curtis also has written some wonderful books that discuss some environmental issues that involve our own backyards & the animals that live there. 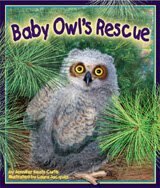 We're lucky to have Jennifer coming to Eagle Cove School next Monday, the first day of our "Bay Week," to share her newest book "Baby Owl Rescue." Can't wait! To learn more about her and her other books including "Turtles in My Sandbox" and "Osprey Adventure," check out http://www.jenniferkeatscurtis.com/ . 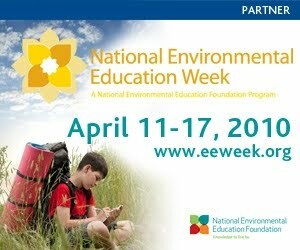 A fabulous resource for parents and teachers alike lives at the National Environmental Education Foundation's Website. They have a very comprehensive list of Green Reads for children. The book lists are sorted by elementary, middle, and high school....and there's a whole other page of resources for educators. This is one of those sites to bookmark because there's so much there you'll want to return to often! Thank you for including my new book in your round-up of green books! I could not be more honored and pleased to be included in such great company. I am in awe of the work being done at Eagle Cove and can't wait to see the great staff and students in action next week! Thanks a million Jennifer...your books are very engaging for kids, and I know my kids (both at home and at school) love them! Can't wait to see you at Eagle Cove next week!